In 1999 a small group of Berliners found out that almost 50% of shares in the Berlin Water Works had been covertly sold to Veolia and RWE as part of a public-private partnership deal. After demanding a referendum so that citizens could vote to see the secret contract, the Berlin city government felt under so much pressure it bought back the shares and remunicipalized the city’s water provision. The initiative started when a small group of members of Attac Berlin discovered that the Berlin Government had sold 24.9% of the shares to RWE and Veolia (each). The group organised a big event in a circus in Berlin to inform people, at the end of which an invitation was extended to those interested in founding an assembly of Berliner Wassertisch (Berlin Water Table). While many attendees were members of trade unions, political parties and other groups, as part of the assembly each person represented only themselves (a principle that remains to this day). The five-year struggle (2006-2011) for the referendum was necessary because without it, the contract would have remained secret, denying campaigners the grounds to go to court. While no political party or media supported the fight, Berlin citizens were so outraged about the secrecy of the contract they voted in favour of the referendum. To get the referendum granted in the first place, 25,000 signatures were needed, but the group got more than 36,000. Then the Berlin Government forbade the group to publish the secret contract on grounds that it would be against the German constitution, forcing them to go to the Berlin Constitutional Court, which ruled in their favour. And when the referendum was held, 98% of the more than 660,000 turnout voted for publishing the contract. The pressure was so great that the Berlin Government bought back RWE’s shares in 2012 and those of Veolia in 2013. Thanks to the referendum, Berlin Water was remunicipalized in 2014. 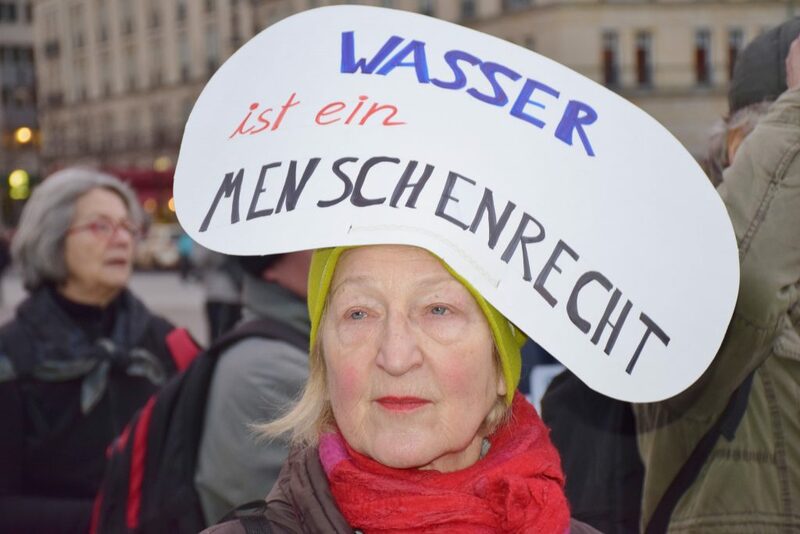 "The story here shows that a small committed citizens group can bring about a major change (remunicipalising water services in Berlin through direct democracy). The fact that the referendum to disclose the private contract was not supported by political parties, unions, big NGOs, media and was a result of voluntary and unpaid efforts looks almost miraculous"